Project „PA7 Knowledge Society“ is aiming to create a society based on competitive research and education infrastructure, innovation supporting and facilitating institutions, and high performing information and communication technologies in the Danube region. The project contributes directly to the EU Strategy for the Danube Region (EUSDR) – it aims to provide financial support to main actors within PA7, thus allowing them to fulfil their roles within the EUSDR and its governance structure. The University of Belgrade - Serbia (UoB) together with the Ministry of Education, Research and Sport of the Slovak Republic (MINEDU) are coordinating the PA7 “To develop the Knowledge Society (research, education and ICT)” within the EUSDR. 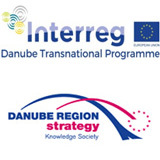 Project “PA7 Knowledge Society” is financed by Interreg Danube Transnational Programme in the period 2017-2019.